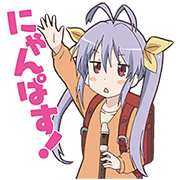 http://www.line-stickers.com/ – NON NON BIYORI REPEAT Line Sticker | Good meow-ning, everyone! This set is perfect for anyone that’s ready to kick back and relax in the country. Send these stickers to your friends to get this class party started!